Over the winter, a lot of the talk around Formula 1 has been focused on the wider cars and more so, the bigger tyres. Yes they look glorious, yes they will produce a lot more grip, and they’ll last longer too. But what about pit stops? 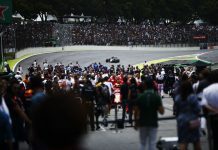 These absolutely crucial few seconds during a grand prix can make or break a chance of a podium finish for the driver and team – we all know that, but these new tyres are massive compared to previous years, and heavier too. It’s no secret that driver fitness is crucial in Formula One. The men behind the wheel are among the most highly conditioned athletes in the world, their bodies honed for stamina and endurance. But what about the fitness of the race team they depend on? With sub 2.5 second stops now the expectation rather than the exception, the slightest fumble during a tyre change can mean the difference between victory and defeat on track. Speed and, above all, reliability are absolutely crucial – which is why the Mercedes-AMG Petronas Motorsport pit crew have been training hard all winter to prepare for the new season. It’s not just the usual skills and drills of the job that they’ve been honing over the long winter months, either – although there has been plenty of that too, of course. Since the New Year, the guys have been working with a new personal trainer dedicated to their health, conditioning and fitness. Naturally, the biggest challenge of the winter period has focused on how best to handle the bigger, heavier wheels and tyres. The rears, for example, are a whopping 80mm wider and weigh 1.8kg more each, while the fronts are 60mm wider and around 0.8kg heavier apiece. While the weight increase isn’t such a big deal on its own, combining that with a significant increase in size is far from straightforward – particularly when it comes to manoeuvring the tyres for pit stops. The tyre stacks themselves are now taller too, thanks to the increased depth of the wheels. Over the course of a race weekend, all that extra bulk and weight starts to add up. Through practice, physical conditioning (and then even more practice! ), the crew will have it all down to an art by the time they hit the pit box in Melbourne. That’s what makes them the very best in the business. But reaching that level doesn’t come without some serious hard graft. In an all-new regime for this year, the guys now train up to five times a week – even coming into the factory during their days off – with three separate pit-stop practice sessions pencilled in during that same seven day period too. With almost 300 practice stops completed back at base alone so far this year, it’s been a gruelling winter for the crew. This training goes way beyond the focus of a pit stop alone, though. They each have a personal fitness programme available via an app on their phones, where they can log in, track their progress and compare their results with their team-mates. There’s nothing like a little competition to make things interesting! These guys have to be warriors to reach the pinnacle of their game – and they know how crucial fitness is to performance. Ultimately, it’s no different to the drivers. Each one of them has to be in peak condition if they want to deliver 100% for their team-mates every race weekend. Practice makes perfect – and it’ll take nothing less than perfection to win races in 2017. 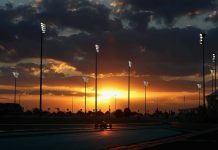 Should F1 have deserted the desert?